Speakers have an advantage when it comes to selling. It’s all about the experience. More and more restaurants and retailers aim to create experiences that connect us to their brands and their products. Think about what happens at Sephora, Bass Pro Shops, Build-a-Bear, and American Girl stores. Think about your choices to frequent theme restaurants where the unique experience (instead of the food) brings you back. The experience is what distinguishes one restaurant from another, one retailer from all its competitors. And that’s where professional speakers are ahead of the curve. From the stage, it’s always been about creating an awesome connecting experience. Now that the world of selling is catching up, consumers will be catching on. That raises the bar for all of us. 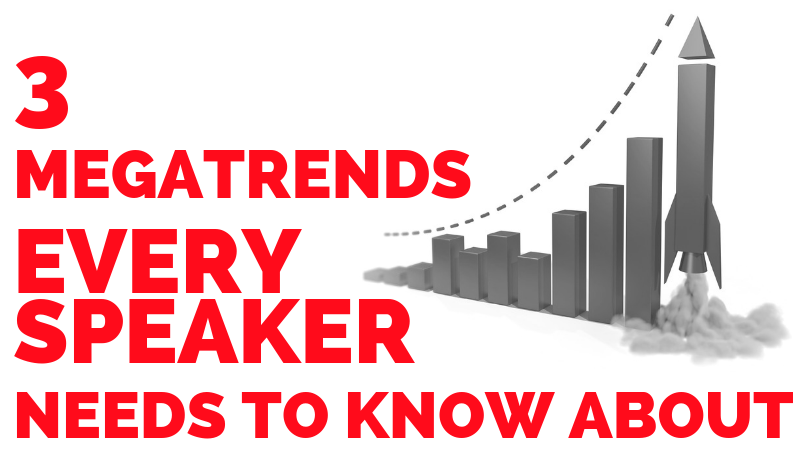 To help you stay on the leading edge, here are three megatrends in selling you’ll be seeing more of… three megatrends you need to keep up with and use as a speaker and when you’re selling, too. Taken together, these megatrends are the component pieces of an awesome connecting experience. Creating value requires dialing into the specifics and making every meeting, every conversation and every transaction a meaningful experience. Buyers recognize and respond when you create value that is personally meaningful. Their reaction is an emotional one, a heightened desire to engage with and even buy from you at that moment. What can you do to offer an unexpected experience that triggers euphoria for your audience and buyers? Did you notice the reference to a “co-creation experience” in the definition of value creation? These two things go hand-in-hand. It used to be sufficient to simply pitch a product, one that would meet the needs of a target audience. That’s no longer the case. Today’s empowered buyers expect their experience with you to include customization. They want to be involved in brainstorming and idea generation. Maybe you’ve noticed more meeting planners looking for something “above and beyond” what you normally do. They may not ask directly, but they respond enthusiastically (euphorically?) when you get them participating to create something special. Or maybe you’ve noticed audience expectations for more participation. People want to post about your presentation in live time. They want to engage with you and with each other in live polls. They want you to stay in the moment (and even go off script!) to connect with them. They want to be participants, shaping your presentation so it’s truly unique for them and them alone. This co-creating applies to insights, too. You may have heard about “insight selling,” a popular sales approach in recent years. It has, however, been badly misunderstood. Far too many sellers research and develop their own insights and then deliver those insights to buyers. Buyers have a ho-hum reaction, hardly the euphoric response they have when they participate in the experience of co-creating insights. This means you can differentiate yourself from other speakers by engaging meeting planners before you pitch what you think they want. Instead, provide an experience for co-creating what you will provide. When you do, be sure to feature those testimonials on eSpeakers because others will respond favorably. When you create value and co-create insights, you will be generating demand. Differentiating yourself from the competition by offering an experience where your buyers participate in creating what they want is all it takes. It’s what has worked for countless retailers and restaurants. It’s what all the research points toward. And it’s akin to what Speakers have already been doing, even before the sales industry caught on! To learn more about these 3 Megatrends in Selling and how to use them to boost your sales, check out this infographic. Deb Calvert, author of “DISCOVER Questions® Get You Connected” and Top 50 Sales & Marketing Influencer for 2014 & 2015, founded People First Productivity Solutions in 2006 to help businesses build organizational strength by putting people first. This work includes sales training and coaching; leadership program design and facilitation; team effectiveness work and executive coaching. Deb formerly worked in senior-level Sales, Operations and Human Resources roles for a Fortune 500 media company. As a member of the National Speakers Association, Deb has delighted audiences as a keynote speaker, moderator, emcee and workshop facilitator. She writes the award-winning CONNECT2Sell and CONNECT2Lead blogs and is leading the movement to Stop Selling and Start Leading!